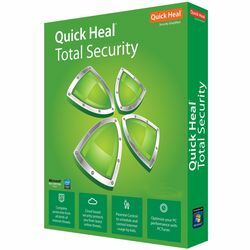 The powerful virus detection engine of Quick Heal Total Security scans and removes viruses, worms, trojans and many other threats that may try to sneak into your system through removable drives, email attachments, and Internet downloads. Spyware is malicious software that is installed on the system without the users' knowledge to gather personal information of the user and to monitor the critical information such as username, passwords, bank account details, credit card details etc. The AntiSpyware feature blocks spywares before they get installed on your PC. It also protects your privacy by detecting and cleaning spywares, and blocking their activities of identity theft automatically. A new advanced malware scanning engine scans registry, files, and folders at lightning speed to thoroughly detect and clean Spywares, Adwares, Roguewares, Dialers, Riskwares and lots of other potential threats in your system. Detects and cleans rootkits proactively by doing a deep system scan. Scans running processes, registry and file system for any suspicious rootkit activity that is kept hidden in the system. Malwares that spread by exploiting the autorun feature of removable devices are on the rise, and USB drives (memory stick, flash drive, portable hard drive) have now become carriers of autorun malwares. USB Drive Protection safeguards your system against such malwares by disabling the autorun feature. The Browsing Protection feature protects your computer from threats occurring through malicious websites. Self Protection feature protects Quick Heal files, folders, configurations and registry entries against malicious activities, and also from getting tampered. Suppresses prompts across all Quick Heal modules and reduces system load which makes activities like playing games, watching movies or presentations uninterrupted without compromising the security of the computer. Automatically scans all accessed web pages for fraudulent activity protecting you against any phishing attack as you surf the internet. Prevents identity theft by blocking phishing websites. So you can shop online, use Internet banking and surf the websites safely. Blocks spam mails, phishing attack mails, junk mails before they reach your inbox. Parental Control is a new feature in Quick Heal that lets parents control the Internet activity for their children. It provides features that can restrict categories of websites or user-specified websites. It also allows parents to schedule Internet access for their children. Virus attack is not just limited to PCs or Notebooks. In the fast-paced mobile world, where people access the Internet using their mobile phones, virus attack on mobile phones is now another outlet for cybercriminals to spread malicious programs. Quick Heal Total Security provides the PC2Mobile Scan feature where you can scan, detect and delete malware, viruses, and spyware from your mobile phones. Apple iPhone, Asus, BlackBerry, E-Ten, E-Volve, Fujitsu Siemens, LG, Mivvy, Motorola, Nokia, Panasonic, Samsung, Segam, Sharp, Siemens, Sony Ericsson, ZTC, HTC, I-Mate, HP, O2 and all the Windows Mobile phones. Data Theft Protection prevents unauthorized copy of confidential or sensitive data from your PC. It blocks access to pen drive/CD writer or other USB storage devices from your PC. Using this feature, neither the systems data can be copied to the removable drives nor the data from outside (removable drives) be copied to your system. You have created a new folder but forgot to add files in the folder. You created a shortcut to a location, and after a few days deleted the location, but not the shortcut. You've been surfing the net for quite some time now and the temporary Internet files have accumulated in the respective folder. All of these are invalid files or junk files that clutter your system hard drive and affects system performance. With the Disk Cleanup feature, you can remove such clutter to free up disk space that can be used for other applications or for improving system performance. It cleans invalid and junk entries from system registry and boosts system performance. Deletes duplicate files of pre-defined file categories, by searching for duplicate files on your computer. It conserves disk space by removing redundant files. It defragments page-files, and registry hives that are used by applications, to improve the performance of the system. AntivirusThe powerful virus detection engine of Quick Heal Total Security scans and removes viruses, worms, trojans and many other threats that may try to sneak into your system through removable drives, email attachments, and Internet downloads.AntiSpywareSpyware is malicious software that is installed on the system without the users' knowledge to gather personal information of the user and to monitor the critical information such as username, passwords, bank account details, credit card details etc. The AntiSpyware feature blocks spywares before they get installed on your PC. It also protects your privacy by detecting and cleaning spywares, and blocking their activities of identity theft automatically. AntiMalwareA new advanced malware scanning engine scans registry, files, and folders at lightning speed to thoroughly detect and clean Spywares, Adwares, Roguewares, Dialers, Riskwares and lots of other potential threats in your system. Anti-RootkitDetects and cleans rootkits proactively by doing a deep system scan. Scans running processes, registry and file system for any suspicious rootkit activity that is kept hidden in the system. USB Drive ProtectionMalwares that spread by exploiting the autorun feature of removable devices are on the rise, and USB drives (memory stick, flash drive, portable hard drive) have now become carriers of autorun malwares. USB Drive Protection safeguards your system against such malwares by disabling the autorun feature. Browsing ProtectionThe Browsing Protection feature protects your computer from threats occurring through malicious websites. Self ProtectionSelf Protection feature protects Quick Heal files, folders, configurations and registry entries against malicious activities, and also from getting tampered. Entertainment ModeSuppresses prompts across all Quick Heal modules and reduces system load which makes activities like playing games, watching movies or presentations uninterrupted without compromising the security of the computer. Anti-PhishingAutomatically scans all accessed web pages for fraudulent activity protecting you against any phishing attack as you surf the internet. Prevents identity theft by blocking phishing websites. So you can shop online, use Internet banking and surf the websites safely. AntiSpamBlocks spam mails, phishing attack mails, junk mails before they reach your inbox. Firewall ProtectionFirewall Protection feature works silently in the background and monitors network activity for malicious behavior to ensure their elimination before the malwares can reach the system. The method of detecting malicious network activity is done by Intrusion Detection System and the method of preventing malicious network activity is done by Intrusion Prevention System. Parental ControlParental Control is a new feature in Quick Heal that lets parents control the Internet activity for their children. It provides features that can restrict categories of websites or user-specified websites. It also allows parents to schedule Internet access for their children. PC2Mobile ScanVirus attack is not just limited to PCs or Notebooks. In the fast-paced mobile world, where people access the Internet using their mobile phones, virus attack on mobile phones is now another outlet for cybercriminals to spread malicious programs. Quick Heal Total Security provides the PC2Mobile Scan feature where you can scan, detect and delete malware, viruses, and spyware from your mobile phones. PC2Mobile Scan supports following mobile phonesApple iPhone, Asus, BlackBerry, E-Ten, E-Volve, Fujitsu Siemens, LG, Mivvy, Motorola, Nokia, Panasonic, Samsung, Segam, Sharp, Siemens, Sony Ericsson, ZTC, HTC, I-Mate, HP, O2 and all the Windows Mobile phones. Data Theft ProtectionData Theft Protection prevents unauthorized copy of confidential or sensitive data from your PC. It blocks access to pen drive/CD writer or other USB storage devices from your PC. Using this feature, neither the systems data can be copied to the removable drives nor the data from outside (removable drives) be copied to your system. Secure DeleteThe Secure Delete feature permanently erases files from the hard drive, as opposed to the normal delete procedure, making it unrecoverable Disk CleanupYou have created a new folder but forgot to add files in the folder. You created a shortcut to a location, and after a few days deleted the location, but not the shortcut. You've been surfing the net for quite some time now and the temporary Internet files have accumulated in the respective folder. All of these are invalid files or junk files that clutter your system hard drive and affects system performance. With the Disk Cleanup feature, you can remove such clutter to free up disk space that can be used for other applications or for improving system performance. Registry CleanupIt cleans invalid and junk entries from system registry and boosts system performance. Duplicate File FinderDeletes duplicate files of pre-defined file categories, by searching for duplicate files on your computer. It conserves disk space by removing redundant files. DefragmentedIt defragments page-files, and registry hives that are used by applications, to improve the performance of the system.